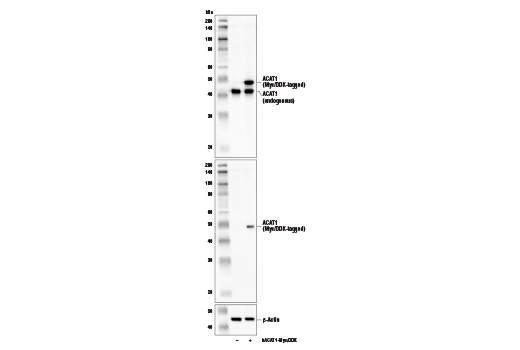 Western blot analysis of extracts from various cell lines using ACAT1 Antibody. Western blot analysis of extracts from 293T cells, mock transfected (-) or transfected with a construct expressing Myc/DDK-tagged full-length human ACAT1 protein (hACAT1-Myc/DDK; +), using ACAT1 Antibody (upper), DYKDDDDK Tag Antibody #2368 (middle), and β-Actin (D6A8) Rabbit mAb #8457 (lower). Immunoprecipitation of ACAT1 from 293T cell extracts. Lane 1 is 10% input, lane 2 is Normal Rabbit IgG #2729, and lane 3 is ACAT1 Antibody. 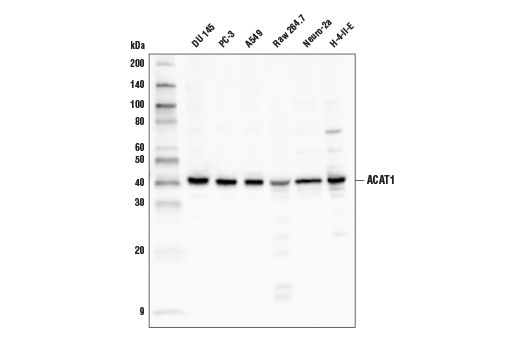 Western blot analysis was performed using ACAT1 Antibody. 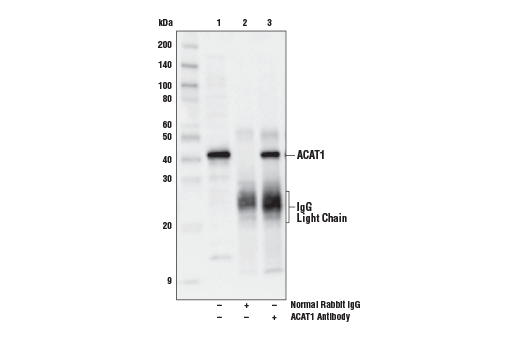 Anti-Rabbit light chain-specific secondary antibody was used for detection. ACAT1 Antibody recognizes endogenous levels of total ACAT1 protein. This antibody does not cross-react with ACAT2 protein. Polyclonal antibodies are produced by immunizing animals with a synthetic peptide corresponding to residues near the carboxy terminus of human ACAT1 protein. Antibodies are purified by protein A and peptide affinity chromatography. Mitochondrial acetyl-coenzyme A (CoA) acetyltransferase 1 (ACAT1) plays a pivotal role in ketogenesis and branched chain amino acid metabolism (1-3). Research studies have demonstrated that ACAT1 also plays a key role in carbohydrate metabolism of tumor cells by directly acetylating and inhibiting the activity of the pyruvate dehydrogenase complex (PDH) and PDH phosphatase, which leads to decreased carbon flux through PDH and increased glycolysis (4,5). Mechanistically, it has been shown that numerous oncogenic tyrosine kinases directly phosphorylate ACAT1 at Y407, which promotes tetramerization and stabilization of the active enzyme in order to drive glycolysis and tumor growth (5). Balasse, E.O. and Féry, F. (1989) Diabetes Metab Rev 5, 247-70. Pohl, J. et al. (2006) Eur J Gastroenterol Hepatol 18, 69-74. Haapalainen, A.M. et al. (2007) Biochemistry 46, 4305-21. Fan, J. et al. (2014) Mol Cell 53, 534-48. Fan, J. et al. (2016) Mol Cell 64, 859-874.